We will meet at the Augusta Museum at 9:30 am on Saturday, September 22nd and move stuff on out to the Aviation Museum to store for the rally. Bring whatever is needed, gloves, water, truck and strong muscles. Gary Allen is ready to go on the 2009 convoy. Here is his personal packing list (Remembering his 50’s and 60’s convoys). We had a meeting tonight with the leadership of the Kansas Aviation Museum about our rally and what they can do to help make it a success. One of the topics was the media coverage expected: TV, newspapers and radio. To maximize the potential for media coverage, it would be good to have an idea how many of us are planning to attend and what we are going to bring to display at the rally. If you are planning to attend, could you please let us know right away so we can get the information to the media contacts. Please try to bring your vehicle, the more vehicles and exhibits the better and bigger the rally. If you haven’t fully restored your vehicle, bring it anyway so we can see how restoring is accomplished. Also, if any of you have military parts or military related things to sell or give to our club store, please bring them. 1970 Kaiser M35A2 2 1/2 ton Military 6X6. Excellent Condition, with extras. New Optima batteries, Custom set of ramps for loading a jeep, or like size vehicle. pioneer tools. etc. etc. Loading ladder. Asking $14,000.00 or best offer. (Might consider trade or partial trade for jeep or pinzgauer in like shape). Thought you might enjoy the article on pages 17 and 18 of the September Supply Line. These are our friends from Topeka. Five of the group came with their M151’s to our first rally. They are the ones who got us into this hobby. TIME: Doors open at 6:00 PM and the movie should start at sundown. your own seating (bring your own chair). CONCESSION: Popcorn, candy bars, water, soda pop, snow cones. JAYHAWK WING PX TRAILER: Will be open for your aviation related shopping. AIRPLANE RIDES: Airplane rides will be available for sale from 6:00 PM until the movie starts. Bring your camera and we will take your picture of you in our World War II airplanes. Would look nice framed on the wall! Help us get the word out! Tell your friends and co-workers. Come as a group! Let us know if you will be attending and how many will be in your party. We’ve got several items for sale in order to help the club raise funds to support various club events and endeavors. 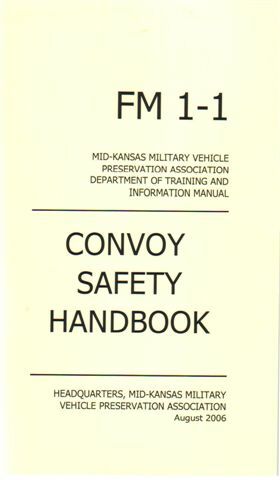 We are offering bottle holders, patches, pins, and also the Convoy Safety Handbook. This instructional manual is available for $3 plus $1 shipping but you may choose to make a greater donation. Please contact Judy Cross if you wish to make a donation and receive a copy of the manual. We thank you in advance for your generosity and for supporting the MKMVPA.